Various table and chair manufacturers have come and gone in the last decade, some of them more than once. With the large target audience in this seemingly simple market, the product has become somewhat commoditized to offer mostly equipment for home use. With most of the production for these items occurring overseas, finding the proper equipment for use in your church can be a little intimidating, but not impossible. The quick and easy answer to this conundrum is to simply concentrate on your needs and pain points. The table and chair market is concentrated on different needs, based primarily in price levels. The simple and honest answer is that the quality of your furniture (in most cases) will be determined by your budget. In order to simply dissect the problem, tables and chairs will be broken into the following segments in this article. To elaborate further on chairs, most young churches often find themselves spending their money on folding chairs, primarily due to price. While these chairs often faithfully serve these churches well for up to a decade, rumblings from the congregation are often heard quite quickly. Folding chairs, for the most part, are very durable, but are often less than comfortable, especially when sat on for longer periods of time. If your intention is to purchase folding chairs, make sure that you are purchasing from a reputable source and that the chairs are of suitable quality. A large number of "poly-fold" chairs have been "dumped" in the U.S. by Chinese manufacturers that did not have the proper experience in building them. These chairs degraded over time and began breaking. Injuries and lawsuits have occurred over these "knock-off" chairs. Bargains can be found, but the question to ask yourself is, "Are they worth it?" 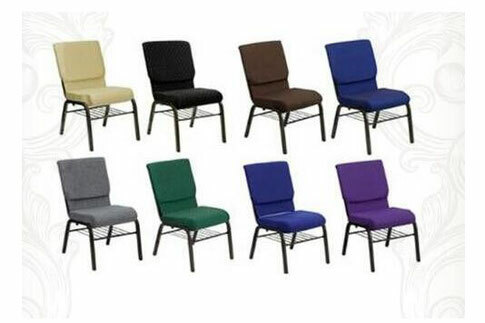 Stacking chairs are also very durable and generally offer much greater comfort. The good stacking church chairs are going to be built with either ergonomic seating, padded seats, or both. The price point here is traditionally two times that of folding chairs. While this investment can be sizeable, it is often deemed as worthwhile, as the "chair" issue is less likely to flair up again after just a short time. These chairs are much more cumbersome to transport and store, so they are often less than ideal in high-mobility environments or mobile churches. There have also been Chinese imports in this market that have been less than reliable, but it is much less of a problem in this segment of the market. Non stacking, padded chairs are what you should be looking at if your concern is that of semi-permanent seating. These chairs will traditionally be the most expensive, but they are the most comfortable. These chairs will not offer much at all in the way of portability or storage. Pickings can often be somewhat slim, as this is the smallest market for mass furnishings. Those that are available will often take six to 10 weeks for delivery from sometimes remote manufacturing facilities. The downside of this arrangement is that they can be expensive and take a great deal of time. The plus side is that if you are looking for a relatively sizeable purchase (100+ chairs), this option can offer you greater choices in colors and fabrics.